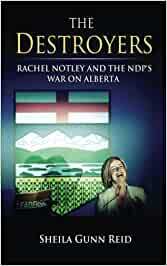 The Destroyers: Rachel Notley and the NDP’s War on Alberta is essential reading for anyone trying to understand Alberta’s new government. Jam-packed with original research, The Destroyers meticulously documents the radical background of key NDP ministers, MLAs and staff, painting a shocking picture of a group of fringe extremists who were accidentally swept into power in May of 2015, without proper vetting. Notley’s NDP are not here to govern Alberta, or to lead it. They’re here to transform it, to terminate all of the Alberta qualities that they’ve been railing against on picket lines and in protests for decades — its culture of entrepreneurialism, its prosperous oil and gas industry, and its culture of freedom. That’s why the book is called The Destroyers. And that’s why everyone in the province should read this quick, fact-packed book, to make sense of the madness. Sheila Gunn Reid is the Alberta bureau chief for TheRebel.media. She’s a stay at home mom of three and a conservative activist. Sheila grew up on the family farm and she has strong ties to the oil patch. Sheila has been a contributor to Corus radio’s Roy Green Show, where she was part of the Hockey Mom’s Panel, tackling issues like government over-reach and encroachment into our families. A very easy read, how Notley can be in politics, let alone be the leader is mind boggling. Oh my, same thing to be said for our federal government. Sorry Alberta, just a few more years to go, things should be good and wrecked by then. Oh my, that also applies to Canada. Really great read, knew she was as unqualified for the job, but after reading this book I am now totally sure she has problems. A very one sided story but at the same time a very interesting read. You may not take it all s truth but where there is smoke, there is fire. Excellent book I recommend it if your the type that likes to be told the truth. 5.0 out of 5 starsGET INFORMED about what really is going on in Alberta!